“Blackfish” is a gripping and thoroughly researched presentation that tells the stories of the histories of orca killer whales in captivity at various Sea World (and Sea World-esque) facilities around the world from the 1970s to present day. Even the local and now defunct Sealand of Victoria plays a role in this never ending tale of abuse and dominance of humans over these sentient beings. When it comes to learning about what goes on behind the scenes in this animal entertainment industry, we are given indisputable information via legal documents, graphic video footage of orca attacks, and first hand accounts as reported by a collection of ex-Sea World trainers throughout the film. As they tell their stories of working with the orcas, you can see that these trainers feel regret, shame, and sorrow for the way the creatures were treated during their tenures, and the way they are still treated now, years later. While weaving pieces of captive whale history together, the film focuses on the story of Tilikum the whale, who has now murdered 3 people in his time of servitude, and we learn about the little before known details of exactly what led up to these 3 incidents of death. The industry PR heads try to spin tales of trainer fault to the public, but upon further investigation, by the film itself, a picture is painted of gross mistreatment of these animals who should be living in expanse oceans and not tiny pens, swimming freely with their pods and not being forced to do tricks for food. Their conditions are miserable; their freedom is non-existent. We see that living in captivity for the rest of their lives leads to extreme frustration and psychosis of being trapped in these jails, and this leads to the orcas purposely lashing out to the trainers, as they have no other outlet for expressing their anguish. (and, interestingly enough, we learn that the average life span for an orca whale in captivity is 25-35 years, whereas in the wild, their life span is the same of that as for humans) Don’t accuse the storytellers of anthropomorphizing the situation for the whales – watch the film and you will see for yourself that this despair is really the case. So why would an animal, such as Tilikum, even be kept to continue to “perform” if he has now a serial track record of killing people? It’s because they need him for his very valuable sperm, we are told, and a pictorial graphic emerges on the screen that shows the family tree of the many other captive orcas that Tilikum’s sperm has created – all for the profit of millions, and totaling to 50 per cent of Sea World’s orca flock. I guess the lives of some humans here and there are worth the cost of running the business. It is interesting to note that many marine mammal entertainment facilities (ie. Sea World) were contacted for interviews in the making of this film, and all declined. So they were not given a platform to tell their side of the story, because they turned that offer down. 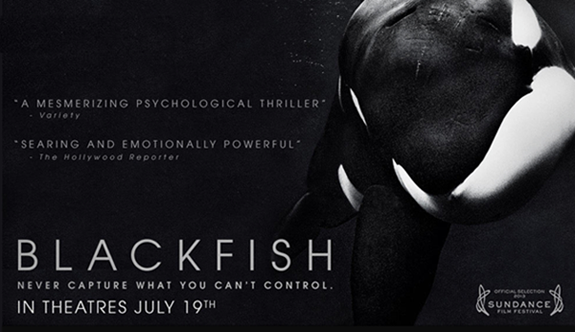 However, now Sea World is arming a backlash upon this film as it debuts in theatres across the continent, in a futile attempt to cover up the truths that we know are so wrong. There is no way that a person watching this film will leave uninformed with the stark knowledge – and thus with consumer power – on what this dirty animal entertainment industry is really all about. It is said in the film (and it is also my opinion) that in 50 years, we will look upon this time in our society as a barbaric culture that treated these sentient creatures in a way that will seem unfathomable to the thoughtful human mind. The content of this film presents in depth and irrefutable evidence of what really happens in this marine animal entertainment industry, and exposes the industry for its true unscrupulous nature. Continued public education such as the documentary “Blackfish” will mean the eventual extinction of this animal exploitation industry as we know it today. Watch this film to get the process started! In Phase 2, the weight loss stopped happening for me. I started off at 135.2lbs at the beginning of this program, and then went down to 132.4lbs after Phase 1 (on the 4 day of the program), went down to 131.4lbs on the 5th day, and then I seemed to reach my plateau, despite exercising every day, and following the meal plan (but eating less than required every day, due to already being full on about half the prescribed amount of food). Actually, on my 6th day, I actually gained weight! Went back up to 132lbs, then down, up, down, up. So at the end of Phase 2, I was a disappointing 132.2lbs, which was pretty much the same as I had been at the end of Phase 1. The headaches started to lessen when I started Phase 2, and were gone by the end of it. Phase 2 introduced pre-biotics and pro-biotics (which are supposed to “eat away belly fat”), plus “healthy fats” such as avocado, coconut oil, and nuts. There were a LOT of these healthy fats from Phase 2 and onward in the program, and so I wasn’t surprised that my body wasn’t losing weight due to the high caloric content of the meals. For example, after one day of Phase 2 where I actually gained weight, I calculated the caloric content of the day’s food (and I had actually eaten all the prescribed food that day, I think, or at least close to it), and it came to 1400 calories! So no wonder I wasn’t losing weight with that kind of caloric intake (where 1 tbsp of olive or coconut oil racks up over 100 calories)! With exercise, I cannot take in more than 1100 calories a day and expect to lose weight. I know other people can, but my body is weird and doesn’t work that way. 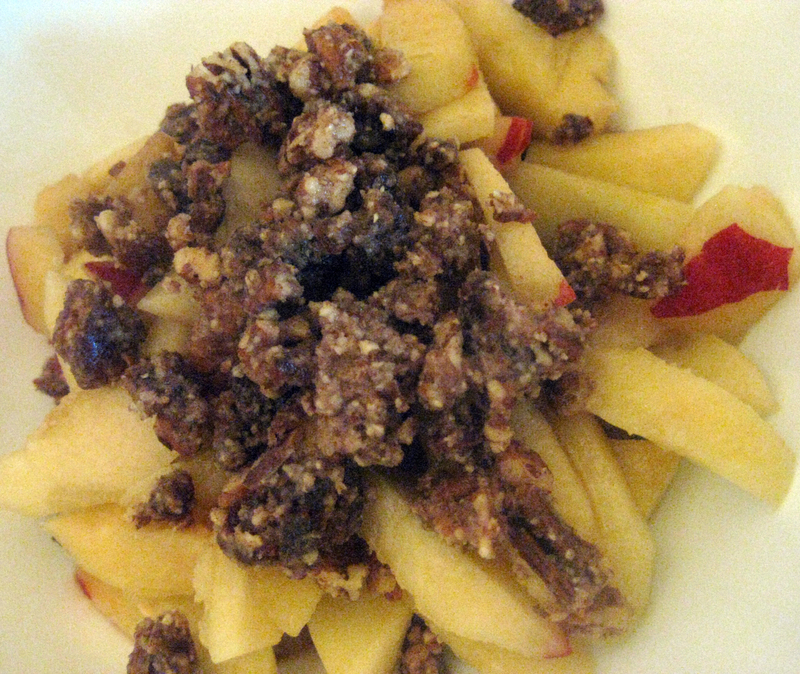 There are some desserts, too, like this yummy and satisfying Peach Crumble. Phase 2 was Days 3-7, and Phase 3 (the final phase) was days 8-15. I was still really enjoying all the different foods in the meal plan, and Phase 3 was no exception. In fact, in Phase 3, you get to eat some yummy desserts! And this is where I want to talk about some of my favorite recipes in the whole meal plan itself. But before I get to that, I should mention that there are a few foods that I absolutely detest and cannot tolerate, and so I omitted the meals that called for these certain ingredients (pineapple, grapefruit, and mushrooms) and substituted them with other meals from that phase or below. This was totally fine to do, according to Ani. She stresses the flexibility in this program, and also stresses that she wants you to be full and satisfied while on this “diet”. (even though it really doesn’t feel like a diet!) So it’s okay to go ahead and make more food to eat if you feel that that’s what you want – but that was never the case with me! 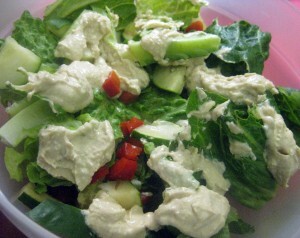 Kreamy Chipotle Salad – another winner. With regards to the salads, I was blown away by the deliciousness of the various dressings, as combined with the really wholesome mix of greens (mesclun mix, romaine, cabbage, etc.) 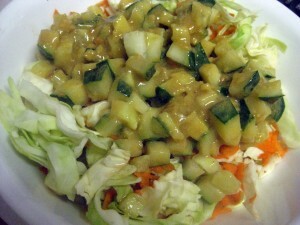 and veggies, such as cucumbers, bean sprouts, and/or shredded carrots. 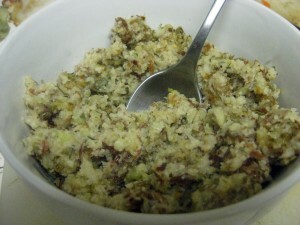 My favorite salad overall was the Spring Sauerkraut Salad with Thermo Dressing. I actually learned to like sauerkraut (which I had always thought I hated, but really, I didn’t) because of this salad, and the mixture of bean sprouts, sauerkraut and the creamy, tangy miso-based dressing was one of the best things I had eaten in quite some time. Again, I must stress that you don’t feel deprived on this diet, and, in fact, the food is absolutely delicious, which is why you don’t even feel like you’re on a diet. Think of it more as just a new and exciting way to eat, rather than a meal plan of restrictions. The Cabbage Salad with Cucumber Miso Dressing was also fantastic (another great dressing on a bed of ever-so-healthy shredded cabbage and carrots), and I loved the Corn and Basil Mesclun Salad because it taught me to eat fresh, uncooked corn from the cob – something that I had not even known before was possible, and so delicious!! Moving on to the soups, you might think it’s weird to eat a soup that isn’t piping hot, because if it’s room temperate or cold, then it’s kind of just like a savory smoothie, right? Right – but there is really nothing wrong with that. Sometimes I would pack my soups for work in my Vitamix drink bottle and just drink it from the bottle – so delicious, flavourful, and sometimes spicy, too! I loved the Coconut Tomato Soup. I loved its simplicity in that it was only raw tomatoes (which I am not a fan of at all, on their own), a bit of coconut oil, a bit of miso, and a bit of ginger and optional garlic. But the mélange of all these ingredients in my blender turned out one of the most delicious concoctions you can imagine! And this was the case for so many of the other soups as well: blend a handful of simple ingredients together and, in minutes, you have an amazing and filling meal to eat that is low on calories and high in nutritive value. This is a way of eating that I need to start adopting into my regular lifestyle. The Celery Almond Pâté – I can eat this forever! As for the recipe section in the book entitled “Rolls, Wraps, Noodles, Patés”, I certainly do have some favorites from here, even though I didn’t eat everything from this section (avoiding the mushroom meals, and seaweed ones as well – another food that I can’t stand). It was from this section that I fell officially in love with kelp noodles, and that is because of the amazing Marinara Sauce that I made to go with them, which was incredibly simple to make and I’m flabbergasted at how blending together so simple ingredients (cherry tomatoes, a few herbs, lemon juice, and olive oil) can make one of the tastiest sauces ever! I loved this dish so much that I made it 3 times over the course of the program. I was also blown away by the deliciousness and simplicity of the Celery Almond Paté, which was so good on its own, I thought. I just ate it straight with a fork – no wrapping or dipping accompaniments needed. When you mix together chopped celery, ginger, garlic, raisins, miso, some herbs, and almond meal, this happens to create an amazing “paté” that I could eat forever. 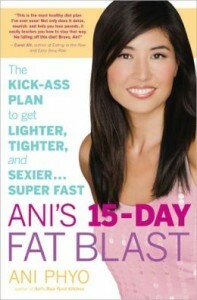 By the end of the 15 Day Fat Blast program, my total weight loss was a paltry 4.6lbs. After the initial weight loss in the “liquid only” part of the program, the remaining daily meals in the program allowed me to only just maintain my weight (all while exercising daily as well). But while I didn’t lose anywhere near the promised 15lbs as I had hoped for at the beginning of this program, I feel that what I gained was so much more valuable, which was the introduction of a true transition to 100% raw plant-based eating. As I said at the beginning of this review, this is something that I had been striving for for the past few years, and now, I’ve finally accomplished it! I’ve been completely raw now for the last 18 days! Fudge Brownies with Fresh Berries – simple ingredients, satisfying flavour. I would like to see this “Fat Blast” program touted not so much as a way to lose weight, but more so as a transition into an extremely healthy (and new) way of eating. 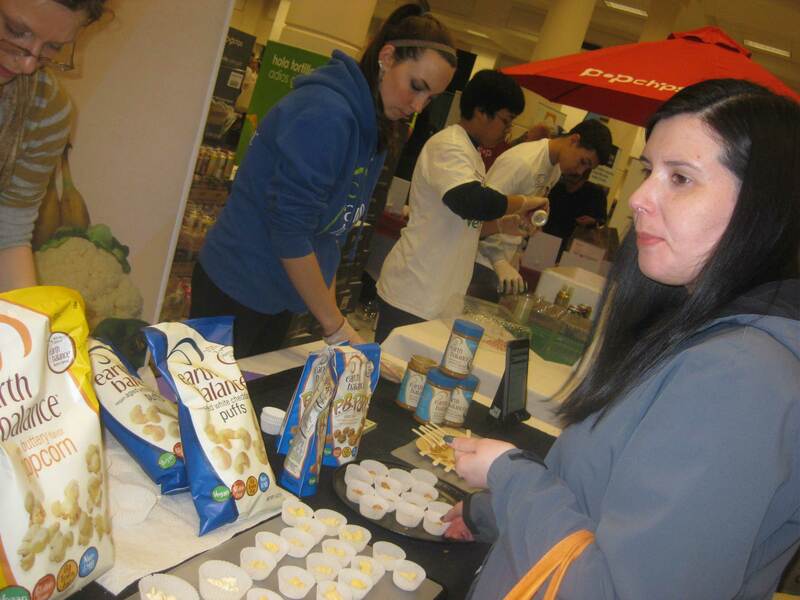 I was able to experience so many good things from carrying out the meal plan of this program. I learned how to make (and enjoy) so many new and healthy foods; my mindset has now shifted, I believe, to want to eat fully (or at least more) raw in the future; and I learned the practical process of how to actually “go raw” (and to do it the right way). When I went into a supermarket the other day to buy some peaches, I looked along the middle isles of the store and it seemed really weird to me to see that these aisles consisted of “food” that was mostly all in boxes and plastic packaging! I feel so much more removed from these processed products now and really have no desire to have them back in my life. What’s in these boxes and plastic bags is not food. Food is the variety of fruits, vegetables and greens that we have abundant to us (at least here in North America), and there are so many combinations in which to eat these that you can never get bored from it. Food is deliciousness that grows on trees or in the ground. Food is not something that has multiple ingredients written on a label, and packaged with preservatives and a big fancy colourful label! It is fully my intention to continue to incorporate many of the recipes in this book into my regular lifestyle, and I am so grateful to have been introduced to these delicious and super healthy recipes that utilize solely whole plant foods. I plan to continue on this path as well in discovering more delicious things to eat by buying Ani’s other books and tackling the raw food books that I already own. So thank you to Ani Phyo for this book! I may not have gotten lighter, tighter and sexier, but I ate delicious, wholesome, and healthy food for 15 days, all made from pure ingredients, and that is what I ultimately value and take away from this experience! I must admit, I have had this book for quite some time now – about a year – and had always wanted to try out this “15 Day Fast Blast” – a diet plan of wholly raw foods -, but had been somewhat apprehensive about it all this time. Why? Although I’ve been experimenting with a high raw diet for the last 2 years, and have been wanting to go completely raw vegan for that period of time, the “fear factor” of consuming only raw foods for 2 weeks kind of got to me. Could I do it? Would it be difficult? Would I be hungry? Going on a “diet” is synonymous to me with being deprived, and I like my food too much to want to be deprived, especially if I’m unsure of what the results will be. Well, one year later, I finally did it, and the only thing that I regret is that it took me this long to finally embrace the challenge! Ani Phyo, for those who don’t know, is a household name in the world of raw vegan cuisine. She is an expert in the raw kitchen and has already put out four other raw recipe books to date. This book was my first introduction to her food, but it’s a bit of foray from her other books that read exclusively as “cook” books; this book is primarily written as a diet plan that promises the reader that they will lose 15lbs in 15 days by following the daily meal plan as provided. Apparently, once you transition to a vegan diet, your “excess” weight is supposed to naturally come off, without effort. That certainly never happened to me when I went vegan years ago (in fact, I gained a lot of weight). So would it work for me when following a 100% raw vegan diet of fruits and vegetables? That was the question, which you will discover the answer to shortly! I love the way this book reads. Ani guides you along the path, as your mentor, giving you encouragement and motivation every step of the way. Her language is fun and invigorating. Her words are consistently conveyed in an upbeat manner, and I must say that it’s this continuous positive re-enforcement that is a key to keeping the reader moving along to actually do everything they need to do to begin the program. She focuses on regularly checking in with your emotions during the program, and so you feel that she is with you there every step of the way. I would think that the 15 day food meal plan program, itself, would be quite daunting for the average person entrenched in a lifestyle of the Standard American Diet to face. But it was even daunting for me, even though I was already familiar with most of the foods needed for the program! I think what was intimidating to me was the whole proposed process of putting all these foods together, multiple times a day, to create creative dishes that I was not so used to eating. (not raw, at least) Luckily for me, I already had all of the non-perishable ingredients (except for the matcha powder) in my pantry, so it was just a matter of buying fresh produce like apples, tomatoes and greens to really get started. Once you have the required ingredients, however (and yes, there is a very convenient set of shopping lists in the book to follow), the food making part is super duper easy, and super duper FUN! Yes, the “blast” part about the diet (in my opinion), is that it’s really just a blast to be able to make all this delicious and nutritious food to eat! 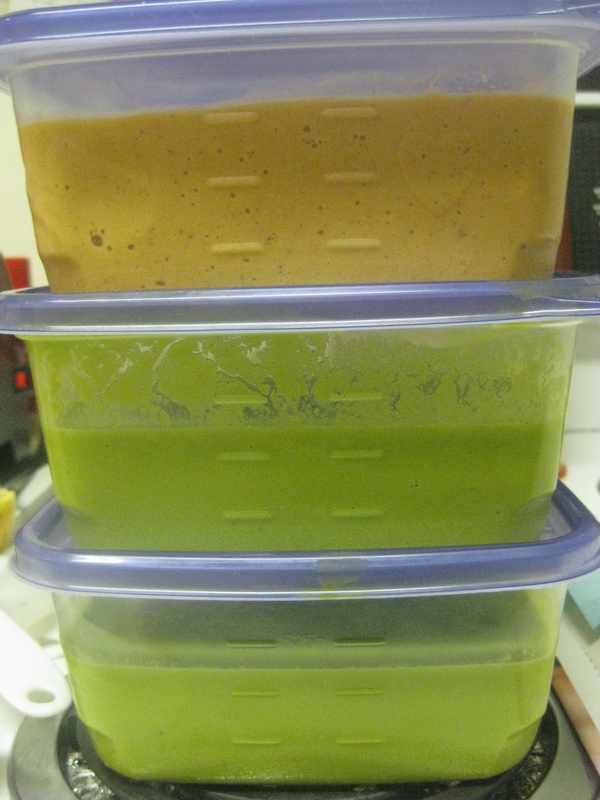 Packing my soups for the day! The 15 day program is broken down into 3 phases. In Phase 1, Ani says the purpose of this phase is to “reboot your body”, so that you can start with a “clean slate and a clean engine.” Fair enough! It consists of a purely liquid diet, and you may think that that means you’re going to go hungry, but this was not the case at all. You’re constantly drinking in your nutrition throughout the day, and, honestly, my stomach couldn’t even take in all of the prescribed daily meals: a shake for breakfast, a shake for a morning snack, a soup for lunch, another shake or soup for an afternoon snack, and another soup for dinner. I found that it really was too much for me, and so my initial fear of “being deprived” was really nothing to be concerned about, since the breakfast shake and dinner soup was about all I could take in each of these days. The drink meals, I found, were satisfying, tasty, and filling. So I was excited through Phase 1. This diet was really working! Oh, I should mention that I certainly began my “detox” headaches during this phase, and that part wasn’t fun. I also think it was a result of the low calorie diet. I felt very weak during this phase from taking in few calories, plus the exercising. And then Phase 2 came along. In Phase 2, the majority of the daily meals still continue to be delicious shakes and blended soups, but green/vegetable salads with dressings are also added in – and so the solid food begins! The addition of salads was really exciting for me, because I really love salads. I really love smoothies as well (or “shakes”, as Ani calls them), and already incorporate these largely into my diet. For any given day, I’ll start my day off with a green smoothie and then have a large green salad with veggies and either beans or tofu for my main meal. But I must admit that I tend to always make a variation of the same smoothie and same salad for every meal, so it was exciting for me to experiment with such a wide array of different recipes every day in these meal-type categories. In fact, I don’t think one single recipe is ever repeated in the diet plan, which calls for making an average of four different recipes a day (with leftovers as your “snacks”). For a foodie like me, this is great – it was always a pleasant surprise to see what kind of delicious concoction would be produced when blending a medley of specific ingredients together. In fact, every day I was excited for the food to come for that day. Only thing is, the food doesn’t just magically appear – you have to spend the time to make it! So, this brings me to the topic of time management for the 15 Day Fat Blast Program. 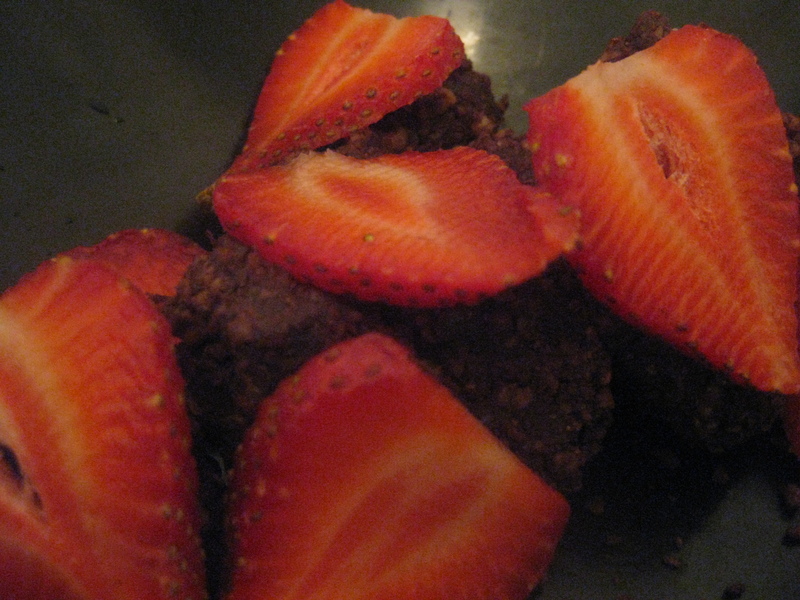 The meals may be quick and easy to whip together as individual “dishes”, but since there are so many of them to make for the day (or throughout the day, if you’re fortunate enough to be able to spend most of your day at home), you really have to schedule the time to create your lovely raw food. If I was working an 8 hour shift and I knew I had to make all my food for the day before going out to work, I would schedule a full hour beforehand to prepare everything, plus wash the (minimal) dishes. This was the case for the first half of the program. For the latter half, I was working mostly at home, so I allowed myself short 30 minute breaks throughout the day to make and eat/drink each meal, whenever I became hungry. If you’re a busy person like me, it is essential to make sure you plan out the time to make your food, since this is a key to the success of following the program! Cabbage Salad with Cucumber Miso Dressing – sooo good!! But really, once you have all the ingredients, and have the time to make the food, there really isn’t a lot more to it. All you need to do, according to Ani, for this program, is to eat! Eat lots of delicious food that happens to be raw, and you’ll lose 15lbs in 15 days. (and she recommends repeating Phases 1 and 2 before moving on to Phase 3 if you have more than 15lbs to lose) Exercise isn’t even a required component of this program, and I’m sure many people will be happy with that. However, for me, I was convinced that I still needed to exercise (for my petulant body) in order to have a chance of success on this program. Because, generally, if I don’t exercise every day, I gain weight. For example, I exercised a lot during the 3 days of Phase 1, and if I hadn’t, I’m convinced that I wouldn’t have lost those 3lbs. Continue here to Part 2. Mother’s Day is today, and it’s a time to celebrate mothers and everything they’ve done for us to bring us into this world. Mother’s Day is a day to celebrate and honour all mothers, including a special group of mothers known as dairy cows. These are mothers who are kept by us human-beings with the purpose of producing 704 million tonnes of milk per year – milk that is naturally meant for their calves, but, of course, is produced all for the consumption by human-beings. As Emily says in this video, dairy cows are kept constantly pregnant during their 4-5 years of “milking” (after which they are considered “spent” and then sent to the slaughterhouse – did you know a cow’s natural lifespan is 20-25 years? ), in order to facilitate the lactation that is needed to produce milk. (Yes, that is right! A cow needs to have a baby in order to produce milk! (just like human-beings!)) And within 1-3 days of giving birth to her calf, her baby is immediately taken away from her, so that the dairy operation can start using her milk for human consumption. This happens time after time during the mother cow’s short life, and if you are a mother yourself, I wonder: how would you feel if the same thing happened to you every time you gave birth? A mother cow carries her unborn child for 9 months, just like a human mom does. A strong bond is formed within 5 minutes between the mother cow and her calf. The bonding process begins when she licks the birthing fluids off her baby, and a cow will only let her baby nurse off her. She instinctively licks her calf’s fur to stimulate circulate and facilitate nursing. 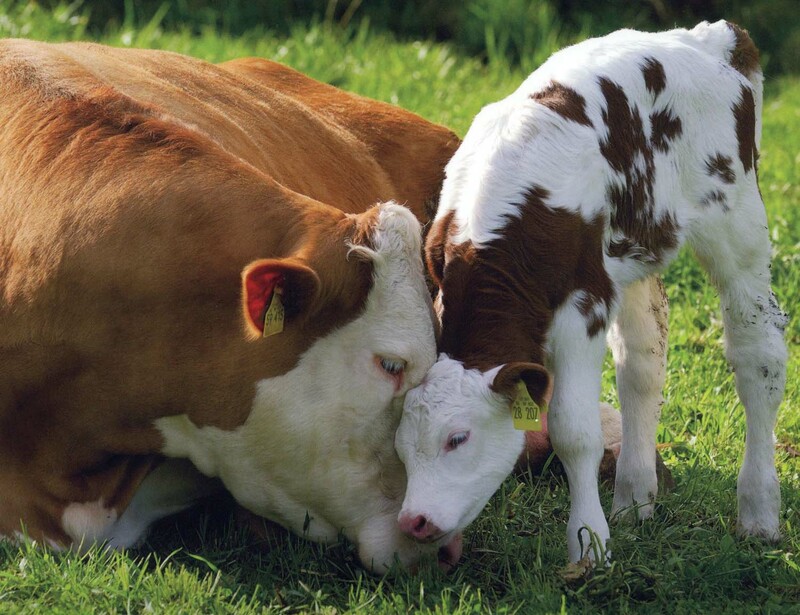 Just like any mother and child, the cow/calf bond intensifies over time and delayed separation can cause extreme stress on the calf, which is another reason why they are separated so soon. And did you know that the casein in cow’s milk actually contains casomorphin opiates that release dopamine into the system? Once consumed, this dopamine has an “addictive” effect, you could say, which makes the baby calf have a natural strong desire to be attached to his mother and keep drinking her milk (which infants need to properly grow and be healthy – just as a human infant needs his mom’s milk). And this is why so many people are addicted to cheese – it’s the dopamine’s effect! Once the calves are whisked away, they are taken to their dismal fates: female calves are raised as dairy cows, and the male calves are kept in tiny crates for 5 weeks where they are malnourished in order to keep their meat a pleasant white (lack of iron) and can’t even turn around in their confinement, and then they are slaughtered for veal – while still infants. “One of my clients called me one day with a puzzling mystery: his Brown Swiss cow, having delivered her fifth calf naturally on pasture the night before, brought the new baby to the barn and was put into the milking line, while her calf was once again removed from her. Her udder, though, was completely empty, and remained so for several days. As a new mother, she would normally be producing close to one hundred pounds of milk daily; yet, despite the fact that she was glowing with health, her udder remained empty. She went out to pasture every morning after the first milking, returned for milking in the evening, and again was let out to pasture for the night, but never was her udder swollen with the large quantities of milk that are the hallmark of a recently-calved cow. I was called to check this mystery cow two times during the first week after her delivery and could find no solution to this puzzle. Finally, on the eleventh day post calving, the farmer called me with the solution: he had followed the cow out to her pasture after her morning milking, and discovered the cause: she had delivered twins, and in a bovine’s “Sophie’s Choice,” she had brought one to the farmer and kept one hidden in the woods at the edge of her pasture, so that every day and every night, she stayed with her baby — the first she had been able to nurture FINALLY—and her calf nursed her dry with gusto. Though I pleaded for the farmer to keep her and her bull calf together, she lost this baby, too—off to the hell of the veal crate. Think for a moment of the complex reasoning this mama exhibited: first, she had memory — memory of her four previous losses, in which bringing her new calf to the barn resulted in her never seeing him/her again, which would be heartbreaking for any mammalian mother. Second, she could formulate and then execute a plan: if bringing a calf to the farmer meant that she would inevitably lose him/her, then she would keep her calf hidden, as deer do, by keeping her baby in the woods lying still till she returned. Third — and I do not know what to make of this myself — instead of hiding both, which would have aroused the farmer’s suspicion (pregnant cow leaves the barn in the evening, unpregnant cow comes back the next morning without offspring), she gave him one and kept one herself. I cannot tell you how she knew to do this. I have one wish for you for this day. Today, on Mother’s Day, I would love for you to honour all mothers. If you are a mother yourself, I hope you can relate to the above story and the info I’ve shared. And if you have a mother (everyone! ), I hope you can relate as well to the experience of love and bonding between mother and child. All mothers inherently want to be with their babies, and nurture them and care for them. And to take that primal right away from them strips these fellow creatures of their fundamental being – that is, the intrinsic need to bond with and nurture their children. When we support the dairy industry by buying and consuming milk products, we deny these creatures these rights. Please, for the mothers, honour and respect them. You can do this simply and easily by not supporting the dairy industry. Cow’s milk is for baby cows (we are the only species that drinks the milk of another species! ), and we can easily enjoy the plethora of different plant-based milks and dairy products that are available today, or that you can even make yourself at home. If you have any questions at all on how to make this transition, please ask me, and I am happy to help you. (that’s what I’m here for!) Here is a good resource as a starting point. This is an internet meme that was shared with me a few weeks ago by a friend, who requested that I do my own 25 Things, so here we are! 1. How did I lose all that weight? People have been asking me this question for the last 2 years, so here you go: I couldn’t eat for 2 months when my soul mate was dying (due to extreme constant anxiety), so that’s how I lost the weight. 2. A new form of physical activity that I’ve taken on this past year is Brazilian Ju Jitsu. It’s so difficult, and such a challenge, both mentally and physically, but I’m committed to it! 3. I feel like an alien here on this planet. Seriously. I feel like I can’t relate to about 99% of the people in this world, when I see so much needless suffering that they inflict upon others, and I just can’t relate to them. I feel like I’m an outside observer, hence the alienation. 4. Perhaps in relation to my previous point, I’m pretty convinced that I’m meant to spend my time on this Earth alone. Recently an insightful person told me that I’m “not meant to be a nun”, but I doubt it! Whenever I get close to someone, they die. 5. I have recently taken up the making of (non-dairy) cheese, and I love it! It’s so easy to make, and you can make so many different types, that actually taste like their dairy counterparts (but with no animal exploitation involved). 6. I often worry about what my purpose in this life is, and if I will be around long enough to achieve my goals and leave a lasting legacy. 7. I work at night because I enjoy it, not because I “have” to. That said, if I won the lottery today, I would stop working my graveyard shifts asap! 8. I am always worried/concerned about gaining all the weight back, because I see how easily that can happen if I don’t keep it in control. However, I have vowed to never let that happen, which means a life of discipline for the rest of my days. 9. I want to be a raw vegan, and am making my way there. I think it’s just a fantastic and the most wholesome way to live. 10. One of my dreams is to open an animal sanctuary, for rescued (abused) animals. 12. I can’t walk down stairs like a normal person, due to a skiing accident in grade 9 that damaged my knee. 14. My two substance addictions are: water, and lip balm. 15. I will exercise until the day I die. No exceptions! Fitness is a HUGE priority in my life (yes, I know you wouldn’t know it by simply looking at me), and is part of the reason why I don’t get ahead in other parts of life – because it takes up a lot of my time. 16. I have a clothes/shoe buying addiction. But because I am so poor (and sensible), I (usually) keep it under control, kind of. 17. I sadomasochistically enjoy pain and being pushed to and beyond my limits. It keeps me interested in life. 18. My Myers-Briggs personality type is INFJ (2% of the population – the rarest type). 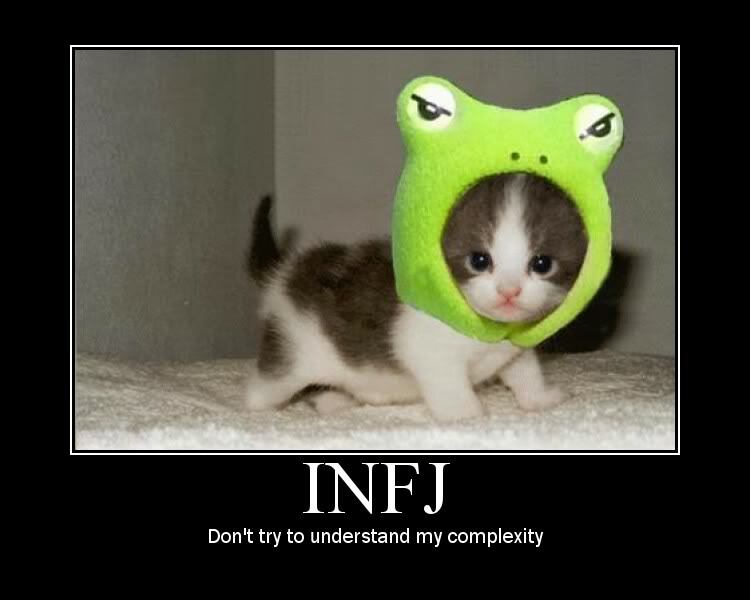 This is me, exactly! So is this. 19. I fit into clothes anywhere from a size 6 to a size 14. It’s weird how clothing sizes can differ so much. And my shoe size ranges from about size 6 to 7.5. 20. I almost constantly have muscle soreness in my body, and a psychic recently identified it and told me it’s because I am guarded and won’t let my emotional pain out. 21. I am a freegan. If it’s free, I’ll take it! 23. A few of my future educational ambitions: to do formal studies in nutrition, and to become a raw food chef, and plant-based food educator. 24. Things that invigorate me and make me feel alive are: swimming in the ocean, having a really good run, performing music, and spending time with someone who I really connect with. 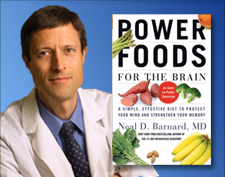 2 Fridays ago, my sister and I went to see Dr. Neal Barnard (founder and President of the Physicians’ Committee for Responsible Medicine) give a lecture in Vancouver, based on his latest book “Power Foods for the Brain“. I’ve seen him speak twice before in person (and several times on tv, now that he is becoming quite a popular personality in the mainstream media), and he never fails to impress me with his sound, expert knowledge on health and nutrition. 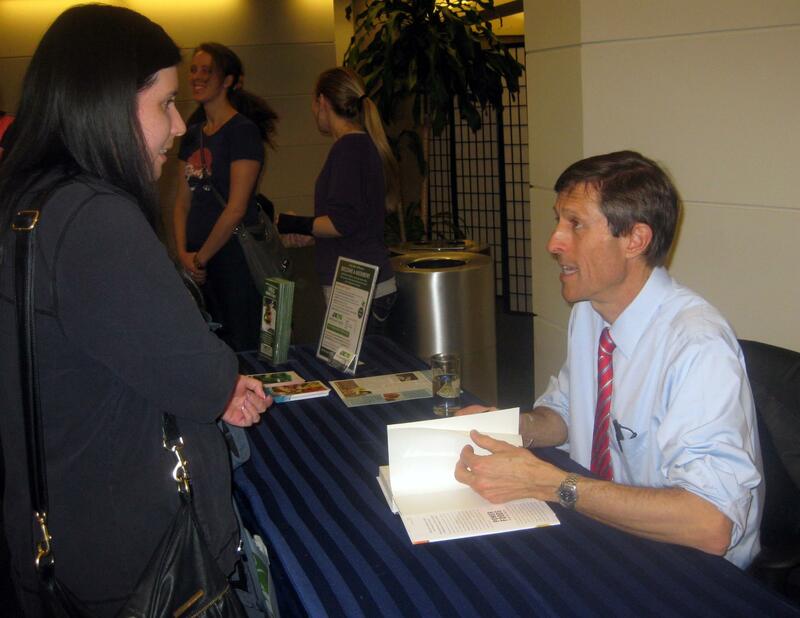 While standard medical school curriculum involves a miniscule amount of nutritional training, Dr. Barnard’s knowledge as a medical doctor far exceeds the norm, and he has dedicated his career to research and education to cure peoples’ ailments with lifestyle changes rather than going straight to the pharmaceutical route. Some of his recent work has been in reversing diabetes, and now he is working on the challenges faced in Alzheimer’s disease, which was the focus of last week’s talk. In his charismatic, articulate and humorous demeanour during this 1 hour talk, Dr. Barnard didn’t just simply deliver the information to the audience, but rather, he offered approachable solutions to making these changes in lifestyle that would appeal to a mainstream public open to learning and adaptation. And I find this communication method to be part of his appeal – he spells it all out so clearly that you feel that there really are no unbeatable obstacles to making a shift for the better. The room held a full house of over 200 people, and Dr. Barnard was gracious enough to take questions at the end, even though we were running over time. Audience members took advantage of this rare opportunity to pose him a variety of nutritional questions, asking about: saturated fats in coconut oil, the paleo diet (a “romantic fantasy”, he called it), raw food diets, fermented dairy, iron needs for children, corn in diet, and pesticides in food. It was awesome to hear him answer each of these questions with discerning information that could be trusted. My sister having a friendly chat with her idol. Another cycle around the sun – Happy Birthday, Ben. A small slice of your life. April 10th will always be a very special day for me, for it marks the date that a very special person came into this world: you. You would have been 44 years old today, an age that is considered “middle” aged by most peoples’ standards, but not by your own life experience. I will always believe that your time here on earth was too short, that you were taken away far too early, and while that is not something that I wish to celebrate, what I do want to celebrate is the fact that you did exist here on this earth, and that you did make a mark on this planet in your nearly 42 years here. People appreciated you and loved you, and I know you made a difference in many peoples’ lives. I know that now because since you’ve been gone, so many of your old friends have reached out to me to convey to me the special place that you held in their life – and for that, I am grateful. What I know is that you would want that. You would want to know that your existence made a difference. You always wanted to be acknowledged for your achievements, and I can understand that if you didn’t have at least that, now that you’re gone, that you would have no “legacy” to leave behind. We all wish to know that we’ve made an imprint on this world, and a positive one at that. During the time I knew you, you felt defeated because you could no longer push on at these “jobs” that made you feel important and useful in life. But I always tried to tell you that who you are as a person is not defined by the work that you get paid to do for a living. Who you are is defined by your character and your values, and what you stand for in life. 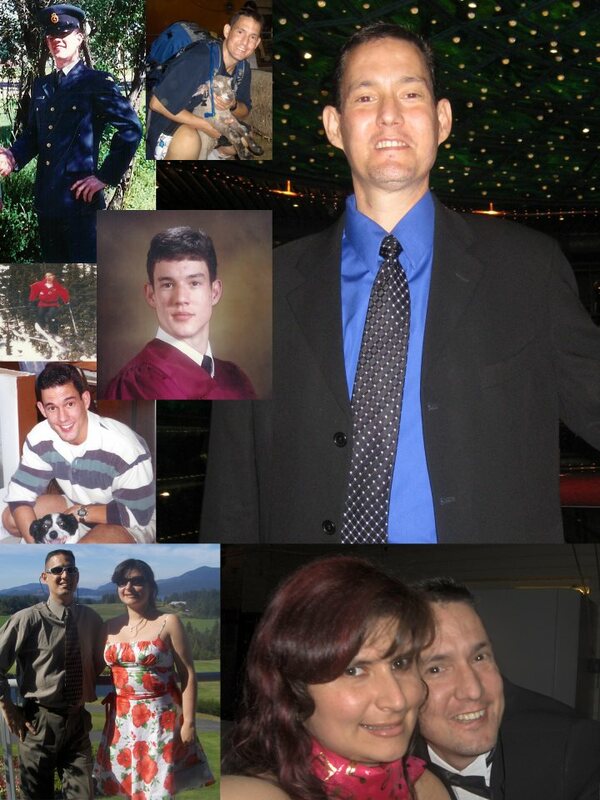 I always saw so much potential in you to live out your true self to the fullest. It saddens me that there always seemed to be so many obstacles getting in the way for you. I tried to help you get past them, but it was just so overwhelming for one sick person and one healthy person to overcome. I do believe, though, that I did help at least somewhat. For the past 2 years, I often think back to your life experiences, as I shared them with you. I would rather concentrate on the good than the bad, and this is why I tried to make many good memories for us in spite of all the hardships. It is more fruitful for one’s psyche to contemplate on the positive, but I didn’t do it just for myself. I was always thinking of the “memories” that you would be left with once you left from this earth, and I don’t know how that works at all, but I think that you must have some kind of memory now of what your Earth-bound life was like, and I truly hope that you are at peace with this. I want you to be happy, as always. I still think of your well-being, even though I know I can no longer carry responsibility for it. You are so special and you will live on in me forever. Today is a day to be happy that you were born. You were born for a reason; you made an impact on me, and many others. I honestly can’t imagine a life in which I never knew you. Happy Birthday, Ben! I wait very patiently every year for this special weekend in March: the weekend of Seattle Vegfest! My friends, dear sister, and I have been making the ambitious day trip to Seattle every year now for about the last 5 years, where we leave Vancouver very early in the morning on empty stomachs, anticipating the gustorary pleasures that lie ahead – those in the form of food, food and more copious and excessive varieties of food. 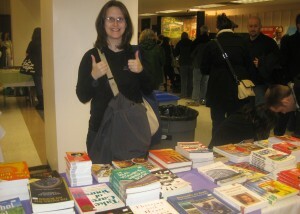 Melissa checks out the book section. Books! So, wait a second – 500 food samples, you say? Yes, I do say! At least that’s what the Veg of Wa’s website always boasts, and this year, in fact, we saw advertisements of 700 food samples being touted. I’m not sure how they could pack in ANY more food into the Seattle Center’s Exhibition Hall than they usually have. It is a very large hall, lined table-to-table from front-to-back and side-to-side, and it is always completely packed with people (certainly not all vegetarians) who are all clamouring to try out a bevy of crackers, non-dairy cheeses, cooked instant meals, vegan donuts, beverages, chocolate, non-dairy ice creams, and all the faux meats you could ever want to taste in the space of a few hours (or a whole day, if you desire breakfast, lunch and dinner for $8 total). Most of the tables are staffed with Veg of Wa volunteers, but many of them also are manned (and womanned) by representatives from the food companies. At this festival, you’ll see food products that are local to the Seattle (NorthWest) area, which you cannot get in Canada, and you’ll also find many national brands as well, many of which are also not sold in Canada (yet), or are but at much more expensive prices than what you’ll find in the States. So it’s a fun way to discover a variety of different packaged foods that you may not otherwise come across in your herbivorous (or omnivourous) existence. Call it a treasure hunt if you will. I must note as well that this is NOT a vegan fair. 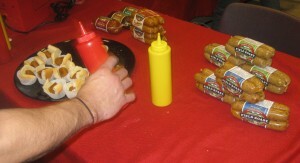 Many of the foods contain animal products (ie. honey and dairy), so it’s essential to ask the volunteers/vendors about that if you don’t want to consume any of that yucky stuff. I wished they had signage prominently displayed to indicate whether the samples were vegan or not, but they don’t, so consumer beware! In addition to the main purpose of the festival, which I designate to be the visiting of table to table to stuff your face with the various proferred samples as you like (that means: be discerning! 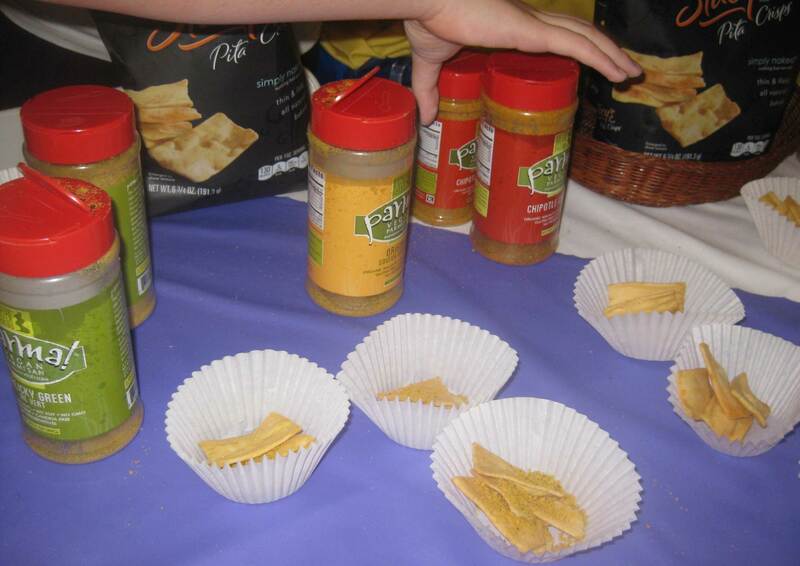 You’re obviously not going to have enough room in your stomach to eat everything there), there are also many free packaged samples to be had, which you can simply dump into your paper goodie bag to take home for later. Not to mention that the Vegetarians of Washington offer a pretty amazing “membership” deal as well, where for only $22, you get a large grocery bag stuffed with… yes, groceries, plus a subscription to Vegetarian Times magazine, plus many coupons for restaurants in Seattle, plus a consultation with a registered dietician! It is well worth the cost if you have an interest in any of those items, and a brilliant marketing plan to acquire a solid member base by the Veg of Wa non-profit organization. Field Roast – My favorite! Someone is getting their hands on some hotdogs there. I love the Alive & Radiant kale chip (etc.) products, and I just wish these were easily and cheaply available in Canada. I got a $1 off coupon at Vegfest and then bought a bag of “cheezy nacho” kale chips later on from Whole Foods. My sister is loving these brand new (at least to us) Earth Balance White Cheddar Puffs here. Both she and Melissa purchased several bags later on, although they just look really junky to me – but hey, they’re vegan! 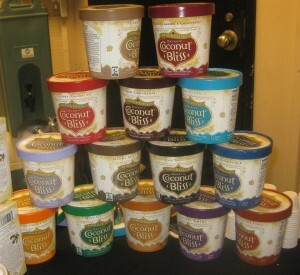 Coconut Bliss ice cream is the best!! 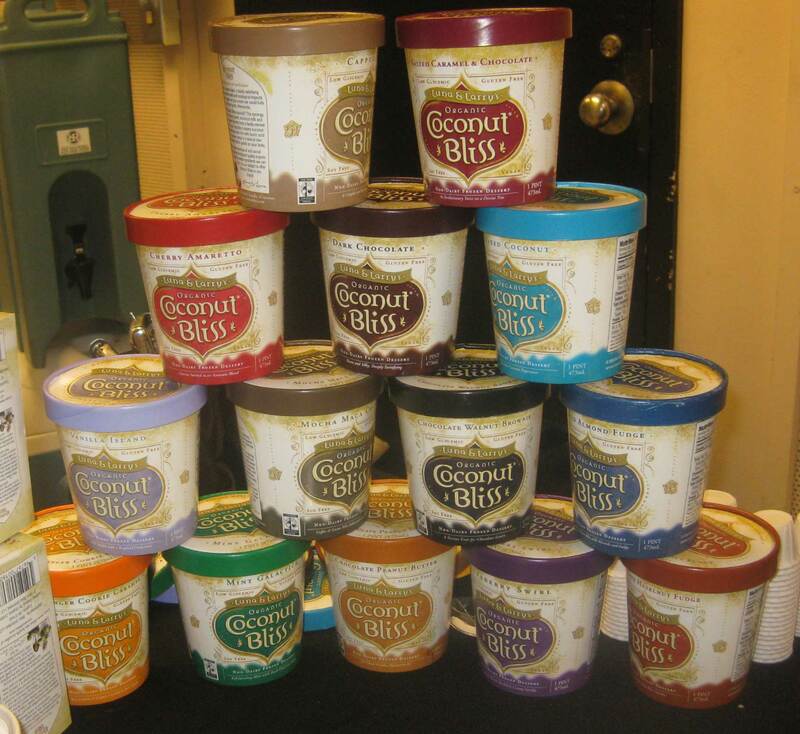 So many different flavours to choose from, and so creamy. There is NO reason to be consuming bovine secretions when you have these wonderful options to choose from! And here we have Parma! So simple, yet so good. It’s a “parmesan cheese” substitute, but basically is just ground walnuts mixed with nutritional yeast, and they have the cayenne and garlic/herb flavoured ones as well. I have all 3 in my fridge and love to use it sprinkled on popcorn. 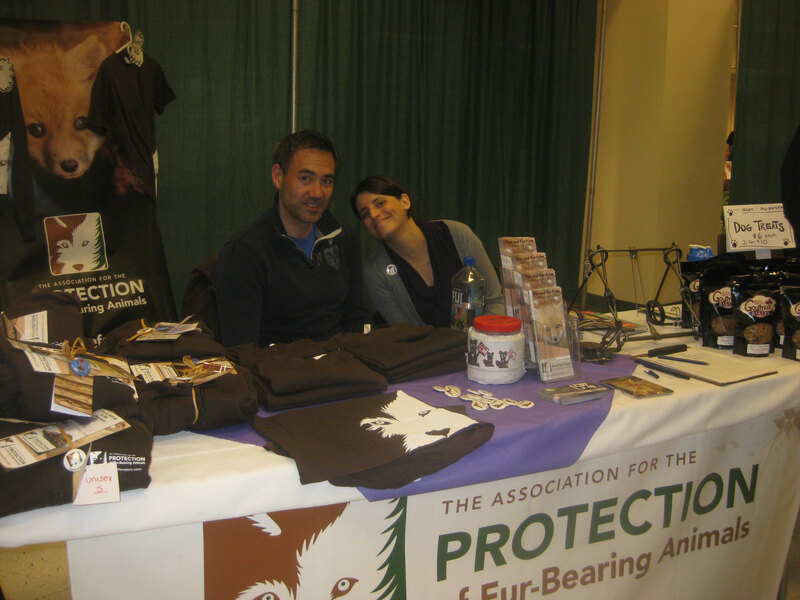 My friend Lesley Fox, from the Vancouver-based organization Fur Bearer Defenders, was at Vegfest again this year, to do her good work in spreading the message for the animals. Prior to the lecture, I saw her standing by the book section, so I grabbed Melissa, who is also interested in making non-dairy cheeses, and we went to meet her and grill her with questions concerning sprouting grains and navigating stinky probiotics. She was a delight to speak with and signed my book for me, which I had brought to Vegfest. It was awesome to get to have a private session with her to expand upon the information she has already conveyed in her book on the art of making non-dairy cheeses, the most special skill required for which, she says, is… patience. Miyoko gives her presentation. I love her! Shortly after, we attended her talk at Vegfest. 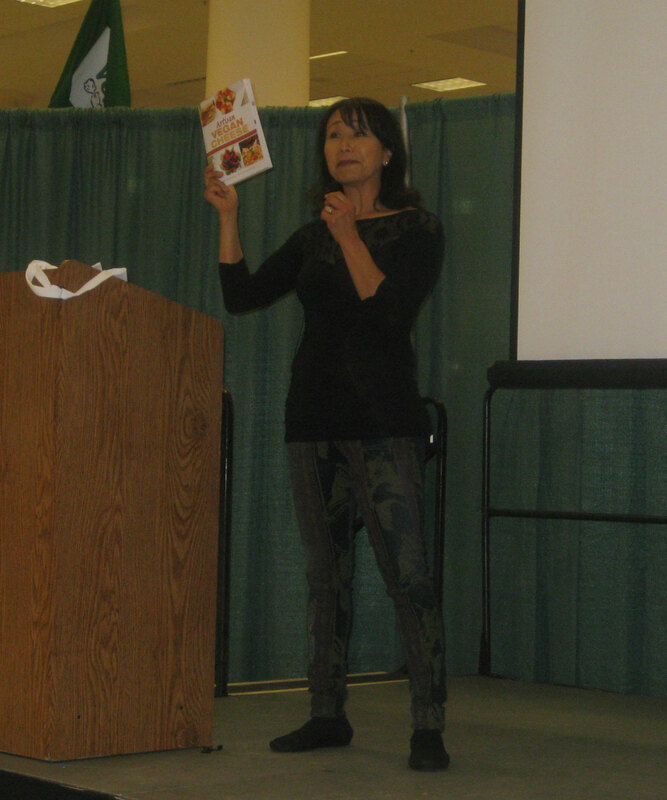 Miyoko is no wallflower and exuded her dynamic personality to the audience while she relayed to us her humourous life story on how she immigrated to Canada from Japan at a young age and thus began her love affair with dairy cheese. I think a lot of us in the room could relate to that loyal love (read: addiction) to cheese that has been cultivated from a young age in our society for many of us. To make her super interesting talk even better, she even handed out a plate of of samples of her cheeses (about 5 different ones) with crackers, which were totally insane. (that means toothsome!) 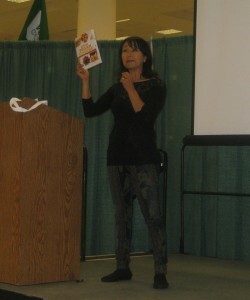 I bet she sold a lot of books after this talk and actually this was the highlight of the 2013 Seattle Vegfest for me! After Vegfest, I already had a headache from having been awake since 3am, but it was time to truck on, as we had grocery shopping to do and dinner to acquire and consume. 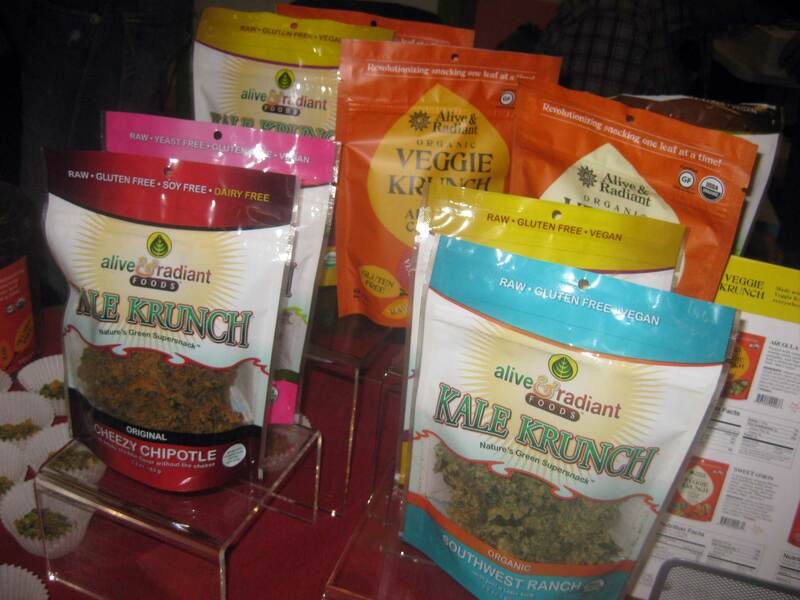 Looking forward to Seattle Vegfest 2014!